It was snowing lightly on Sunday evening and I was on my way back home from Kings Cross. Ten minutes into the journey, a homeless girl came through my train begging for money. There was a long and awkward silence amongst the passengers in the carriage. People looked away nervously. I asked the girl if she’d mind being drawn, then gave her a little money and had her sit next to me for a sketch. When I had finished drawing, I asked Dionne to write the words “I want to…”, and to add in whatever words that she could think of. To my relief, she did seem to relish adding a few words to my book (a horrible thought had just flashed through my mind that she might be unable to write). What did I take away from this? My pencil sketches do not plumb any emotional depths. They do not illustrate anything of the odd relationship between a begging girl and comfortable train passengers, nor do they hint at her worry over where she would spend the coming night. From the artist’s point of view, I’d need to think better on my feet if I’m to come up with more meaningful images. My basic little drawings seem to have brought up many questions and left them without answers. In fact, the images themselves are rather unsatisfying, but the experience of creating them has led me to think. Though I didn’t attempt flattery, the shape of the girl’s face is quite attractive, and she looks young enough to have plenty of life to look forward to. My sketches (she was pleased to realise), do not show the skin sores on her face which in real life make people look at her in horror. And what of Dionne – though she consented to be drawn, was I somehow exploiting her in this situation? She wrote that she wanted to change her life, and I said a few well-meaning words to her. Once I’d confirmed that she was getting good healthcare (yes) and would have somewhere under cover to sleep that evening (it would probably be a night bus), I pointed out that she was good at sitting still, and that artists or art groups in London would pay for models. In my ignorance, I could not think of anything truly constructive to say. Who takes on a model without a fixed address? I eventually left the train with the uncomfortable feeling that I had failed this girl in some way. Yes, she’d asked for money and I had given her some of this (though not enough for a night’s stay at the YMCA). But as a fellow human being, and also as someone who’d looked closely at Dionne and drawn her, I wished that I’d had more to offer for the longterm, perhaps genuinely helpful advice or a good contact for her. 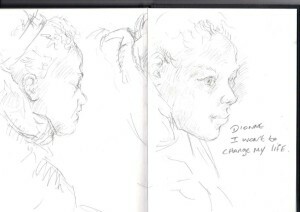 Perhaps the most positive aspect of our exchange was the way in which, despite the skin sores which she said repelled people, I had Dionne sit next to me and looked at her in the same way as I would any other human model. And our drawing time did also give other passengers a chance to think. As soon as I had finished, the lady across from me offered Dionne some fruit, and I noticed that she was then given money by others further along the carriage.